When winter sets in, rather than hiding under layers of fleece and down, consider using your time to your beauty advantage. With shorter days comes the absence of powerful sun exposure, making winter perfect to explore skin treatments that do not combine well with the sun. 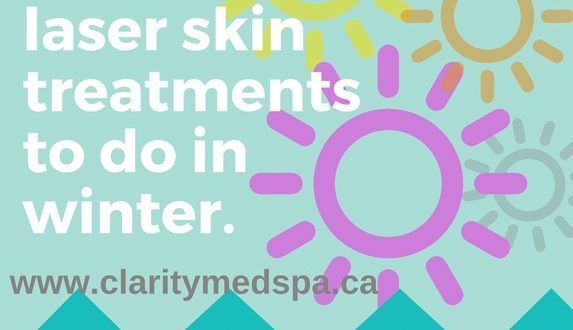 At Clarity MedSpa and Laser clients gravitate towards laser treatments, focusing on reversing the signs of aging, treatment of scars, removal of tattoos, smoothing of cellulite or elimination of unwanted hair. 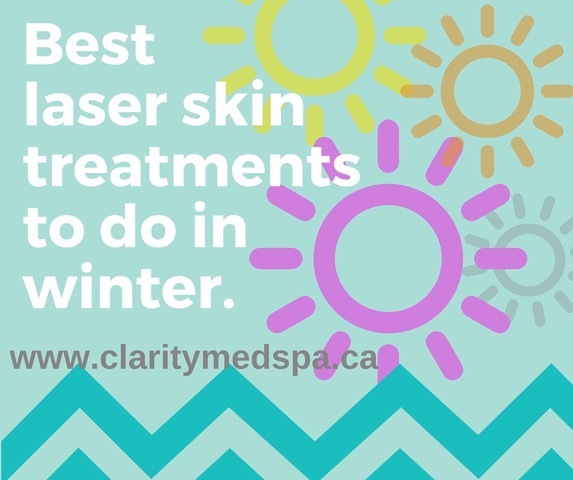 It is for this reason that Clarity Medspa & Laser sites the most popular winter appointments as those that can erase sun damage and/or pigmentations. It is the pursuit of an even skin tone that makes laser and intense pulsed light treatments so popular – these include Photo-Facial / IPL, Fraxel™ Dual and Pixel™. “IPL targets pesky blemishes, redness and brown spots, while Fraxel™ Dual can address anything from pigment to smokers’ lines, wrinkles and acne scars. Pixel™ can also address texture as well, pore size and discolourations. In either case, now is the time to do it all” says Nurse Chantal. Chemical peels produce consistent and visible results and our clients love them! Keep in mind however, that they can make skin sun sensitive! Once again, making winter an ideal time to try such treatments . Peels encourage cell turnover which can temporarily increase ones vulnerability to the elements – winter extremes either in temperature, indoor heating, wind and cold can dull the complexion. To offset these negative effects, treatments such as Dermapen micro-needling and derma-planing can easily restore radiance. Laser technologies are highly affected by skin tone, therefore being “tan- free” means better, faster & safer results. If you are considering cellulite procedures such as Exilis Elite™, winter is the perfect window between seasons, allowing you to move through a treatment plan that will have you ready by summer. Ready to part with that permanent note on your wrist, shoulder or lower leg? Winter is ideal for Tattx™ tattoo removal. Because these treatments require several sessions, it is best to deal with tattoos that are not covered by clothing, through the months that have less sun. This assures you of a safer and more effective outcome.